A female entrepreneur in Nigeria named Betty Irabor has taken to narrating a very funny event on Twitter. According to her, a Nigerian man who is unemployed privately chatted her up and demanded her assistance. In response, she talked to her HR and the male in question was contacted. What happened next was hilarious. In her narration, Betty who is the founder of the renowned Genevieve Magazine said the HR had asked the man to come in for an interview. But he blatantly turned it down with the assertion that he did not apply for any job. 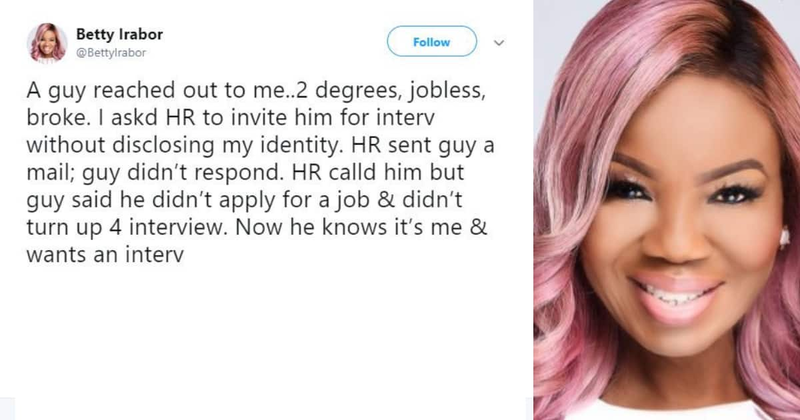 The female entrepreneur was pretty much surprised that a person would turn down an interview that he asked for, although not in the formal way. This caused her to take to her Twitter page to share the puzzling issue. She said: "A guy reached out to me..2 degrees, jobless, broke. I askd HR to invite him for interv without disclosing my identity. HR sent guy a mail; guy didn’t respond. HR calld him but guy said he didn’t apply for a job & didn’t turn up 4 interview. Now he knows it’s me & wants an interview." Most Nigerians commented in defence of the man in question. According to them, he must have thought that it is a scam call meant to dupe him of his little money. Following this, Betty posted a tweet giving an update about the matter. According to him, the man was later allowed to come in for the interview. One hilarious event happened after this issue went viral. Unemployed Nigerians took quick action by bombarding Betty with job applications with the hope that they might be lucky enough to get his attention just as the guy with two degrees did. Recently, the entrepreneur took to slamming people who made others feel insecure with their words. She also shared her own experience.